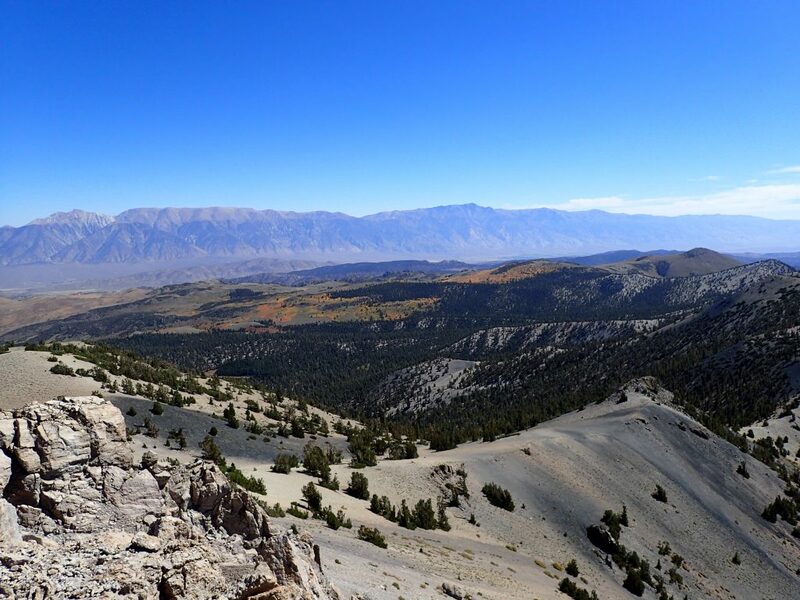 Glass Mountain is an ancient volcano in far flung Eastern California. Rising to an altitude of 11,128' , its jet-black profile hides fields of obsidian and a few hiking trails to boot. 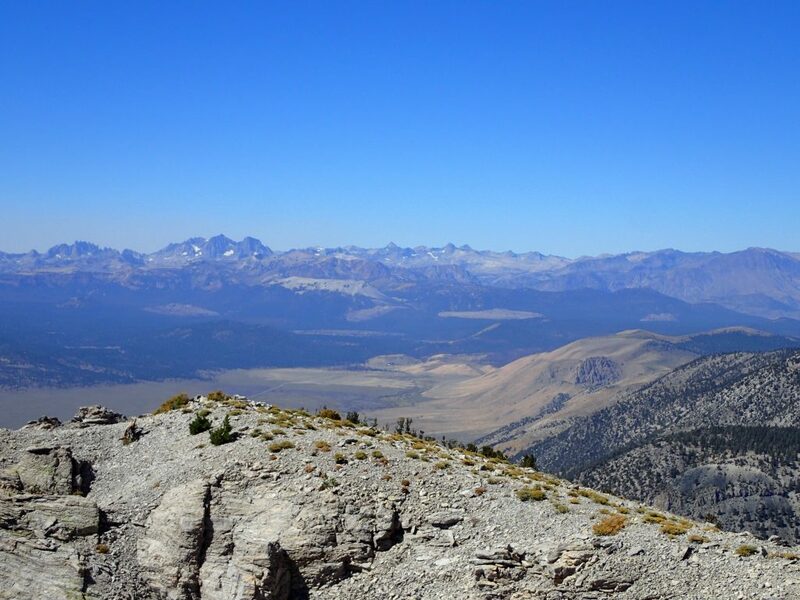 My final summit on this three day ramble through the Eastern Sierra was Glass Mountain. 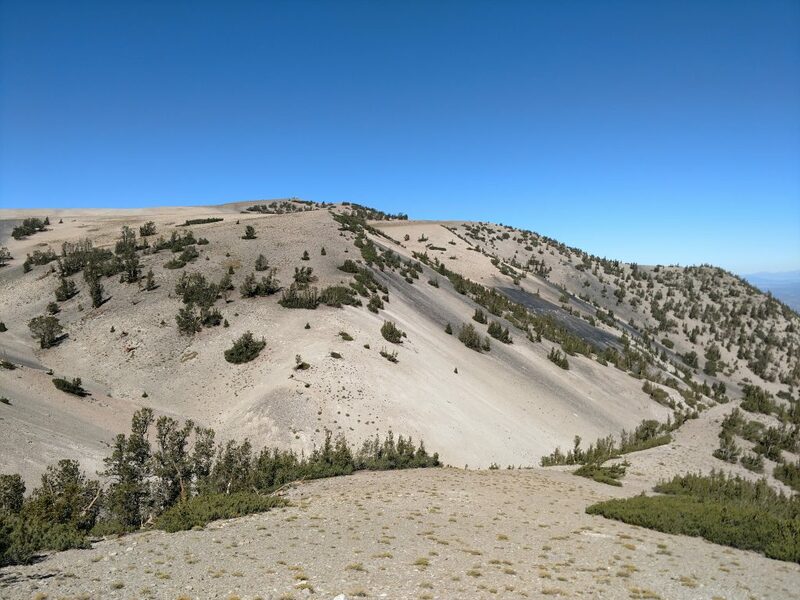 This volcanic summit is part of the Long Valley Caldera and nearby Mammoth Mountain. Sporting some fantastic views and interesting geological history, I knew this would be a great treat. Aspen forests with fall color added to the delight of hiking these mountains in September. Getting was half the fun for me. I started in Lee Vining, California which is a small town on the shore of Mono Lake, California close to the eastern entrance of Yosemite National Park. From the intersection of Highway 120 with US 395, I drove south for 4.7 miles. At a very obvious junction with CA 120, I turned left and set my odometer to zero. 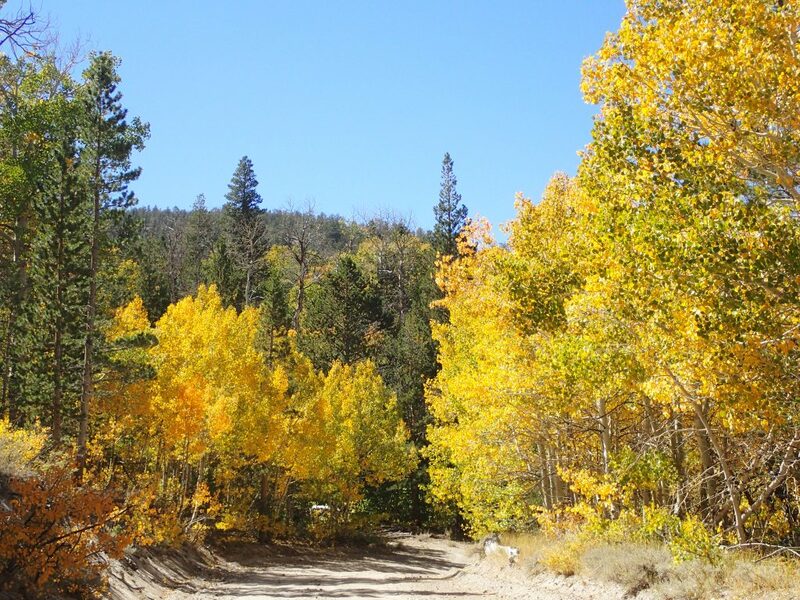 This is a beautiful drive only open about 5 months of the year during the summer to early fall. Sometimes its closed even into June if the weather is still snowy. From the junction of CA 120 and US 395, I drove 31.8 miles to Black Canyon road which is easy to miss if you're not looking for it. I drove 0.8 miles before coming to a fork and stayed to the right which is Sawmill Meadows Road. This continued for 6.6 miles gaining a ton of elevation before arriving at another fork with a sign for Sawmill Meadow pointing left. After turning left, I went another 3.6 miles before discovering a very faint trailhead for Glass Mountain. All of these roads are well graded dirt highways though a few chucks of obsidian rock were hazardous on the wheels. I'm glad I didn't bust a flat. 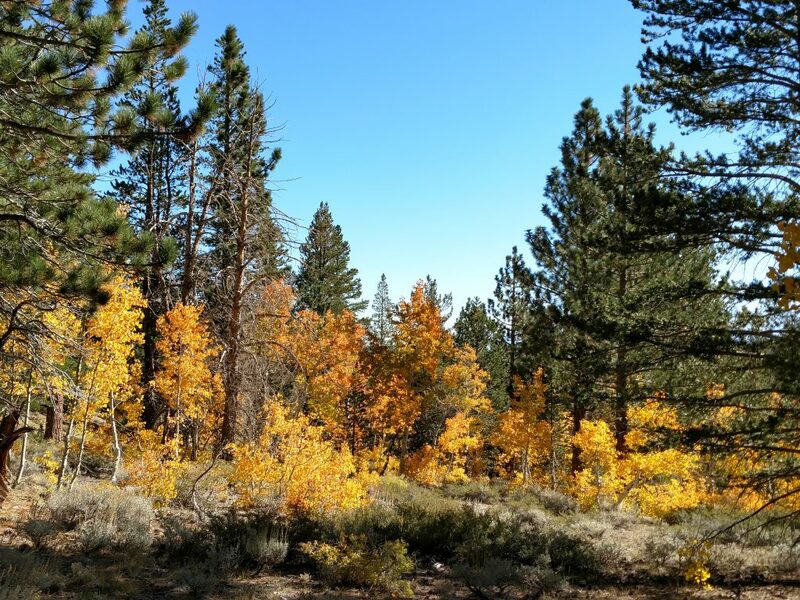 Of course, check with Inyo National Forest for any road updates but as of September 2018, the road was in excellent condition all the way up. As you see above, the "trailhead" is simply the obvious bend in the road just before the turnout for Sawmill Meadow. There's a few large logs pulled up to prevent any further travel by vehicle but once I hopped the makeshift barrier, I found the trail. It appears it was an old jeep trail at one point so this made initial route finding easy. After a few hundred yards, the trail enters the canyon of a small, dry creek bed and mostly stays to the right of the canyon's bottom as it ascends. At several points I found diverging herd paths but as long as I used the dry creek bed as a marker, I didn't get lost. 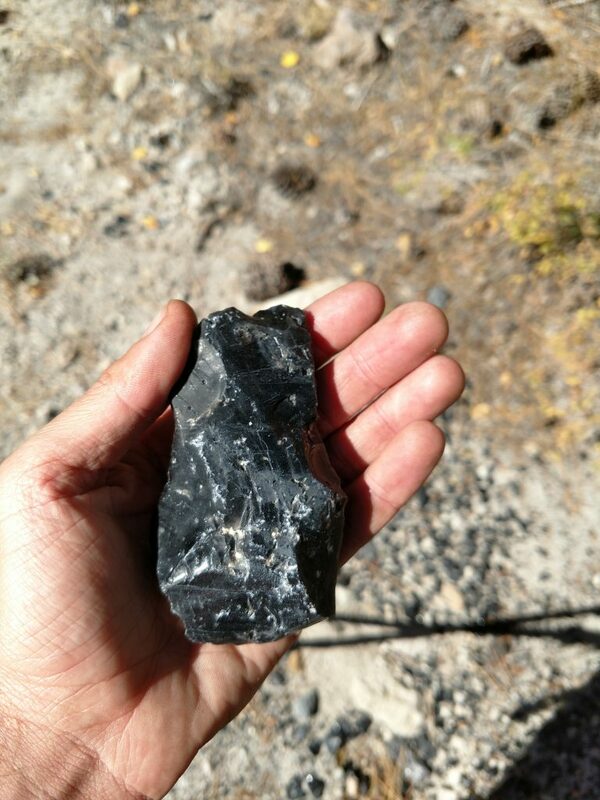 After getting out of the small canyon created by the creek bed, I came across fields of obsidian. This is why the mountain is titled "Glass Mountain" is the abundance of this rock which is essentially volcanic glass. When lava is cooled quickly, obsidian is the result. Though not a rare nor precious stone, its relatively uncommon. Sharp to the touch, obsidian makes perfect arrowheads and is used experimentally as a scalpel blade. I cut myself accidentally picking up one of these razor sharp stones! Somehow a forest of limber pines rooted themselves through the slopes of obsidian which created a rather artistic view. At about 1 mile into my hike I had views of the White Mountain Range across the valley with the highpoint of Nevada clearly visible. Still following a faint trail, I worked my way past 10,000ft and saw the radio repeaters on the North Summit. On Google Maps, the North peak is marked as the Glass Mountain but don't be fooled- its a shorter arm of the true summit. 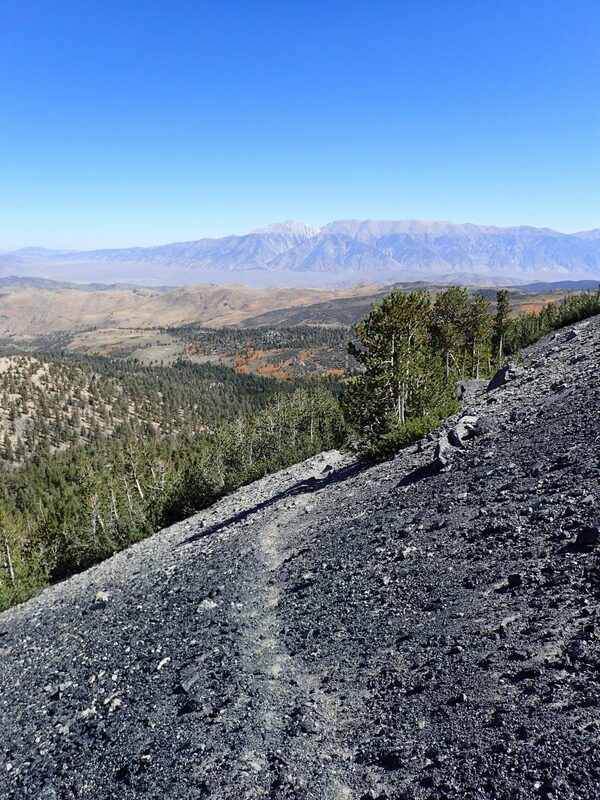 Just a quarter mile from the summit the very steep trail gave way to a flat saddle and the phenomenal view of Owens Valley enveloped me. This profoundly arid valley lies in the shadow of the Sierra Nevada and the equally tall White Mountains. Its only from the summit of Glass Mountain that one appreciates this two mile deep valley. Its a special view at the top. Without the remnants of the Long Valley Caldera, you'd need an airplane to get this kind of perspective. I spent a good half an hour at the top and found two summit registers to sign. Coming down wasn't too hard but I recommend keeping a GPS with you- its much easier to lose the trail down. Sliding down razor sharp obsidian scree added to the hazards but I managed to get down without getting to scratched up. I completed the hike in less than three hours- note that includes a ton of stopping time for photos and appreciation of the obsidian fields! I made my way down the mountain roads without any problems and ran into only one other car on the whole trip. Afterwards I made my way back to the Bay Area but this might be a mountain I actually climb more than once. If you're interested, the Mono Craters nearby Mono Lake have equally fascinating volcanic history without a burdensome overland drive to see them.